Steve Turco is guided by the belief that people do business with people, and it’s that very personal connection that creates true customer satisfaction. It’s an interesting perspective for someone who does an increasing amount of business with customers who are unlikely to ever visit the store he manages, whom he might never see, and who sometimes aren’t even in the same country. As General Manager of the Barnes & Noble College bookstore at Boston University, Turco is connecting with students from one of the nation’s foremost distance learning campuses – and that has resulted in a very individualized approach to customer service. Yet even before it became fashionable, Boston University began to extend the reach of its campus in a distance education initiative Jay Halfond, former Dean of Boston University’s Metropolitan College, described as “an academically credible, highly engaging, rich and rigorous endeavor.” That program has grown over the past ten years, garnering the United States Distance Learning Association (USDLA) and Sloan Consortium awards, along with over 6,000 distance education alumni and a total annual enrollment of over 3,000 students. To put that accomplishment in perspective, the bookstore now sends books and learning materials to every state in the nation, and between 30 to 40 countries every academic semester. 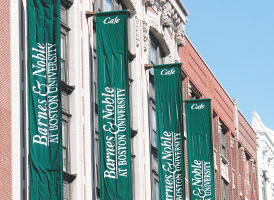 Barnes & Noble at Boston University supports both on campus and online students. In many respects, accessing the store is as easy for distance learning customers as it is for those on campus – simply by using the bookstore website. But fulfilling those orders highlights the unique needs of the remote student. “Typically, we’re going to have a book in the store two weeks prior to the start of the semester,” Turco says, “but we also need to be able to answer the question of how much sooner a student will need that book if we’re shipping to Qatar or China or even San Francisco.” This requires a skill set that few bookstore managers need to employ, and ensuring vital learning materials are received on time at a military base in Afghanistan or Iraq, demands a shrewd knowledge of logistics. “There’s a lot we need to work through to correctly meet our customer’s expectations,” Turco explains. “It required additional information to determine the timeline to get publishers to ship to us earlier. We also needed to understand all the shipping details – tariffs, the correct way to declare materials for customs – to ensure shipments arrive on time,” he adds. And it’s not just far-flung destinations as Steve points out. “We also may, for example, have a very limited window to deliver a book to a specific U.S. hotel at a specific time to a student who may be travelling,” he says. To cater to those specialized customer needs, the store has a dedicated staff member who works with the university’s distance learning department to manage all of the nuances of the process, and to problem-solve in a unified way. It’s an approach that has proved successful, and as the distance learning program has grown, the bookstore has developed a solid system managing their book lists and the needs of each individual customer. One other component that the University considers key to the program’s success is the opportunity to help develop a sense of community for their distance-learning students. Using social media is just one tool Boston University employs to connect with its students. The bookstore also plays a role by sending BU decals along with every introductory letter it sends to distance students and hosting commencement events for those who can make it to the store. It’s a two-way process, and it’s not uncommon for a distance learning student to include a BU hat, mug or Terrier shirt to their book order as a way of achieving a greater sense of connection with the campus community as a whole.